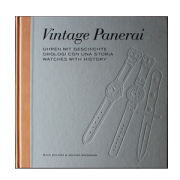 Karlsruhe, 12 September 1998 – it was a saturday morning, just perfect for a little walk and some window shopping at watch dealers, as I got interested in mechanical wristwatches since a couple of years. 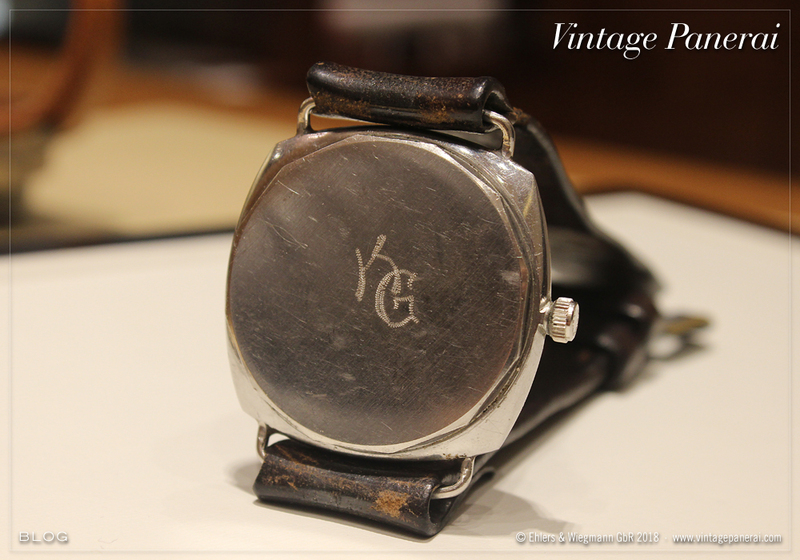 I walked into the shop of Jewellery Kamphues who is based downtown Karlsruhe since 1905, a house with a long tradition which carried some of the watch brands I wanted to take a look on at that saturday twenty years ago. 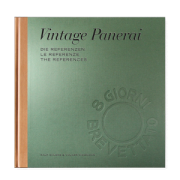 What I saw in one of the displays inside was a big brown box, loaded with six very untypical, huge but even more attractive watches from a brand I just read in a watch magazine: Officine Panerai. This saturday in September 1998 was a good chance to see these new watches in person. 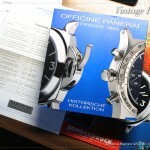 To get a good impression about how things were going with Officine Panerai back in 1998, when I met the brand for the first time, I highly recommend reading the interview by Joe Thompson with Angelo Bonati, which was just recently published at Hodinkee here. I kept this squared brochure from 1998 in my library in all the years and I always wanted to return to Jewellery Kamphues one day. Recently it finally happened. One of the reasons I wanted to travel to Karlsruhe was, that the manager of the shop contacted me a few months ago, asking if I would have some additional information on a Ref. 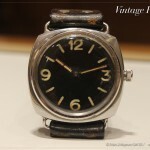 3646 / Type D with painted brass dial. 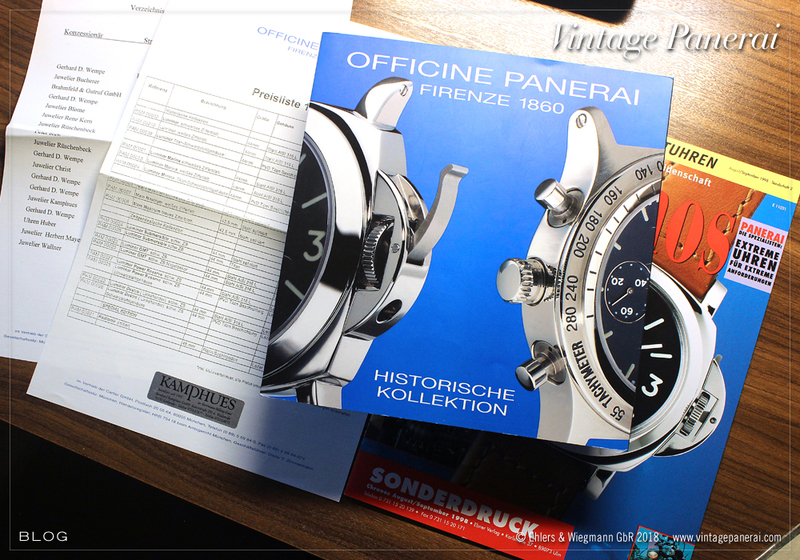 I was surprised to take even notice that this watch – which we knew for quite some years – found its way to the dealer where I saw watches from Officine Panerai for the first time back in 1998! The 3646 / Type D in question was added into our database already back in 2004 when it was on display in a little museum in Hamburg, where my co-author Ralf spotted it. 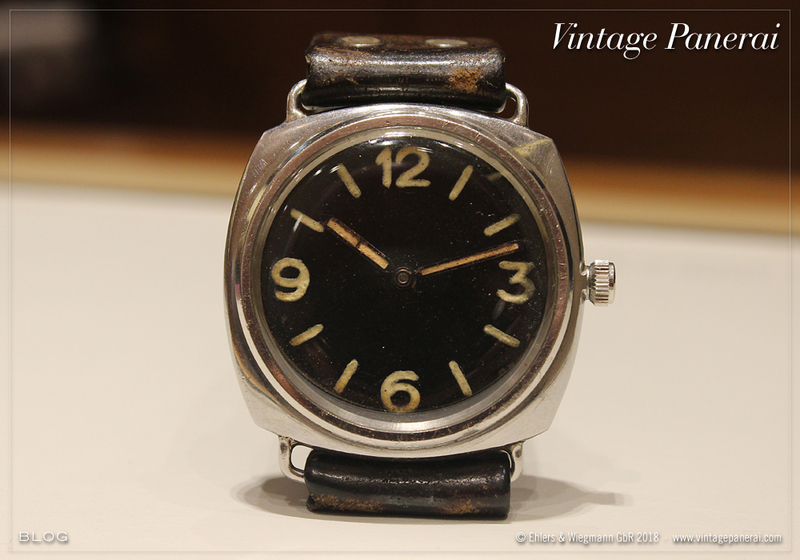 He was allowed to take some photos of the watch but not from the inside (movement, inner caseback) so it remained an incomplete database entry in our records until it was consigned for auction in 2017 (read more in our watch point). Dr. Crott Auctioneers contacted us about the watch before their 95th auction and by its external details (especially the engraved initials on the caseback, as well as the original leather strap and buckle still on the watch) we were able to identify this watch being the same that Ralf discovered already 13 years ago in 2004. So here it was: the moment to return to the place where I saw watches from Officine Panerai for the first time in 1998 – 20 years ago – and to meet with the managers of the shop which we exchanged some information during the last months about the engraved “Kampfschwimmer” watch from the Second World War. 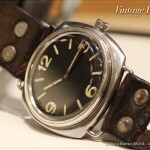 Actually its great to know where a watch went after the few occasions when it surfaced since we took notice of it. Now it found a great place in a display at Jewellery Kamphues where it is spot on, even customers and visitors of the shop can take a look at it. Back in 2004 the Ref. 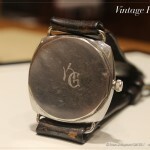 3646 / Type D with engraved “KG” on its caseback was in a little naval museum, more or less resting in a quiet corner. Later the museum moved into another location and since then it disappeared – we lost its track. For the following 13 years we heard no safe and sound of it. 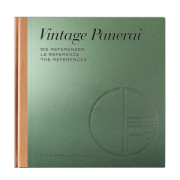 To our surprise it surfaced at an auction house in 2017 and now it found a good home in Karlsruhe. 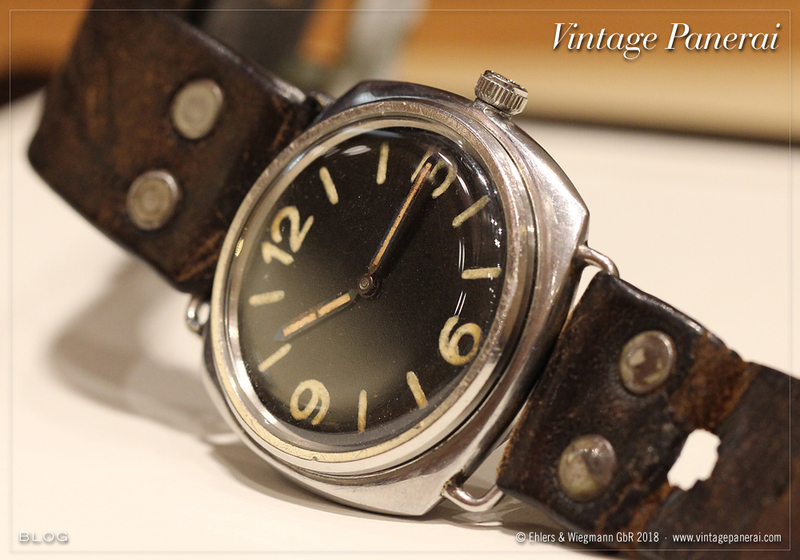 It was a pleasure to feel the excitement of the new owner (by the way he was wearing a nice Luminor Marina PVD from the A series), where it is part of a collection of excellent vintage watches.